Scrap Trader Kidnapped, Held for Ransom in Ningbo. Shanghai Scrap is on book leave until November 1. And after I complete this post, I’m going to hold to that promise. First, a brief backgrounder and then I’ll get right to the source material. For a decade, the top US and European export to China, by volume, has been the scrap metal and paper used as a leading raw material in China’s world-beating industrial production. Exact figures don’t exist, but one can safely assume that roughly 30% of the aluminum and copper used in Chinese industrial production is recycled, and that percentage has been growing, continually, fueling ever higher prices for scrap commodities on the world markets. European and American owners of scrap inventories could travel to China and literally audition dozens of potential buyers for their material, each offering better prices and terms. If you were a “foreign supplier” with scrap, the Chinese would buy it, sight unseen, on the assumption relatively safe assumption that the material would increase in value between the port of origin and China. But in recent weeks that sure bet has become a very, very bad one. Like oil and other commodities, scrap metal and paper prices are in a free fall, and – in some cases – at three year lows. Throughout China, scrap importers are left sitting on inventories purchased at record price levels that will not return this year, or next. Making matters worse, Chinese industrial production has slowed dramatically, leaving the country’s scrap traders with few outlets to unload inventory – even at a steep loss. The result has been a near total freeze in the scrap trade. A few containers, subject to past contracts, continue to move. But even that trade is threatened: in recent weeks, many Chinese traders have refused to honor contracts signed when prices were high, leaving exporters no choice (in some cases, an extorted “no choice”) but to accept less money – and losses – for material that’s already en route to China. Reportedly, there are unclaimed shipments idling at ports throughout China. And that’s when the importers are being nice about things. On Friday, an industry friend forwarded the following memo to me. By mid-afternoon, the memo – and the news contained within it – was ricocheting around the small, very tight-knit world of international scrap traders. I’ll offer a commentary after the second page. For now, keep in mind that Ningbo Yibao Import & Export Co. Ltd is a subsidiary of Zhejiang Arts & Crafts Import & Export Co. Ltd, a major, province-level state-owned enterprise in Zhejiang [click the letter for enlargement]. I’ve spokent to two [update: three] individuals close to the Ningbo scrap trade who assure me that the general narrative in the memo is correct. I have attempted to contact Ningbo Yibao, but so far my calls have not been returned. I am awaiting a call-back from the British Foreign Office. I spoke to a representative of Goldarrow this afternoon, and they stand by the account in the letter. When I spoke to Mr. Sampath, the managing director, he added that the alleged kidnapping took place in the check-in area of Pudong Airport at roughly 3 AM. For now, a couple of additional notes. First, since the early 1980s, Zhejiang Province has been one of two import bases (southern Guangdong is the other) for China’s non-ferrous scrap metal import industry, and Ningbo has been its most important port. The provincial and local governments have provided consistent, high-level support to the industry, investing in individual companies, and even developing an integrated recycling park – in Ningbo – designed to curb some of the worst environmental abuses associated with the industry. Second, before the market crash, the Sheraton Ningbo was a hub for the scrap import-export trade. On any given night, there would be – I’m guessing here – half a dozen traders in its rooms. 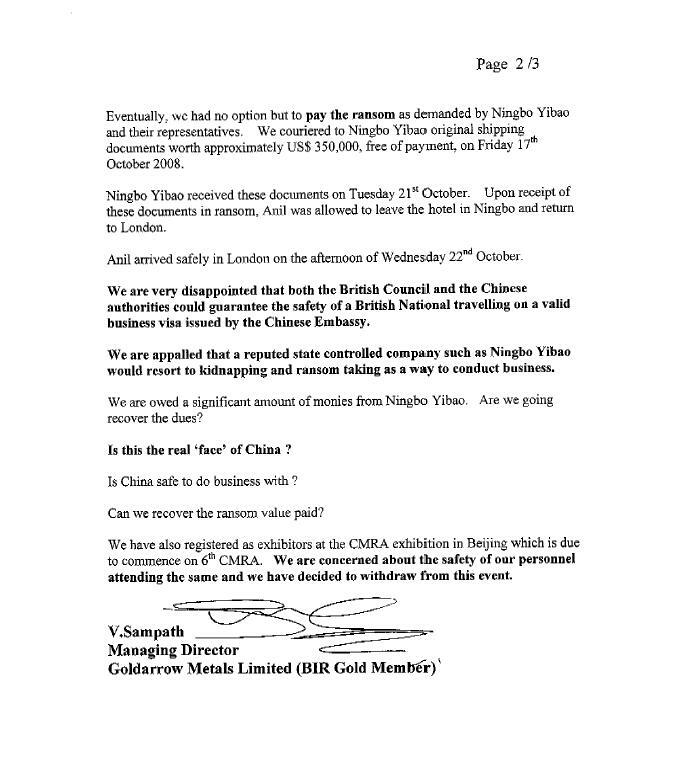 Third, the last paragraph of the statement references the CMRA Exhibition. This is the annual convention held by the China Nonferrous Metals Industry Association’s Recycling Branch, and is unquestionably the most important scrap metal-related event held in Asia, each year (full disclosure: I was a speaker at the last two exhibitions). Last year’s event drew 1300 participants to Guangzhou, including roughly 300 foreign traders. The market downturn has already, reportedly, impacted attendance; I imagine that this news will negatively impact it even further. Finally, I wouldn’t want to draw too many conclusions from a single incident, but I will say that the panic (and violence) starting to bubble up through the Chinese scrap markets seems to indicate a much deeper manufacturing recession than what the rather sanguine, China-can-weather-this-storm narrative, has previously provided. I noticed an article ISRI Alertâ€”International Business Conditions and Personal Safety while visiting International Customers appeared in ISRI website, which had been forwarded to ISRI members. We fully understand the situation of financial crisis now, some suppliers are suffering loss, some contracts have been cancelled, and price been forced to be discounted. Crisis is hurting Chinese scrap companies too. Most plants were closed down or half closed, others went to bankruptcy with lots of workers lost their jobs. The situation in scrap industry attracted high attention from Chinese government. CMRA is actively arranging a small seminar attended by related government officials and scrap enterprises both china and overseas to find workable solutions during the Beijing forum. Iâ€™m sorry to say that the â€œkidnappingâ€ mentioned by a UK company is not the fact. The truth is that the suppliers from England miss-loaded scrap copper with aluminum scrap. Then, the representative of supplier came to Ningbo to negotiate their Chinese buyer, and agreement finally reached after long time discussion during which some unpleasant things happened. This is just a single case in trade disputation, so we can not call it â€œkidnappingâ€. We really hope companies of scrap circle can gather together during our convention in Beijing from Nov.7th -9th and ensuring personal safety. Letâ€™s find a way out together. We are pleased to communicate with ISRI and BIR under the situation of global financial crises, on matters of how to help the scrap import and export enterprises to get over the difficulties and find a good way to solve those trade disputes. We do hope those enterprises both domestic and abroad could contact us directly when confronting with those trade disputes, and we will do our best to assist to find friendly solutions. Weâ€™ll be much appreciated if you can forward this message to your members to state clearly this matter, and we would like to extend our warm welcome to Mr. Bob Garino of ISRI to deliver a speech on behalf of ISRI. This is a good post but you shouldn’t have blogged it on the weekend. Your competitors now have two whole days to report it more thoroughly and have something in their papers by Monday. None of them will mention that they learned about it from your blog. Mark my words. An extremely interesting story. I know nothing of the case, but would suggest that someone high level with administrative ties had a personal interest in the shipment. Seriously, forward this to the Financial Times, et al. Interesting stuff, almost of parody world. Agree with the first poster. A journalist is rarely going to quote a blog. They should mention you by name, at least. Why was the trade not on a common L/C basis paid FOB or CIF? There would be no reason for the trader to visit and inspect the shipment. The fact he visited and suggested 3rd party inspection suggests something is askew – any L/C trade should always include independent 3rd party inspection. Alex – by Chinese law, all scrap exported to China is pre-inspected by AQSIQ or – more commonly – a company contracted to it. But, for reasons too lengthy to detail here, those pre-inspections aren’t taken seriously by the buyers OR the sellers. They are perfunctory, at best. As a result, when there are disputes, a third party is called in. Now, as it happens, disputes are quite common in the scrap industry. Partly, this has to do with the fact that – despite internationally accepted standards – there is still quite a bit of art, as opposed to science, in grading scrap. One man’s top grade is another’s low grade. As a result, it’s quite common for an unhappy trader to dispute a delivered load (per terms)in hope of securing a few extra percent of profit. Basically, a way for the buyer to negotiate post-contract. Finally, because scrap grading is an art, it’s not uncommon for sellers to travel to China and inspect shipments, with buyers, so that they can better understand buyer requirements, and hopefully better tailor their shipments in the future. In short, and as in all things, the scrap trade is a little different.. Fascinating post, definitely worth breaking your self-imposed embargo. Adam, excellent post. 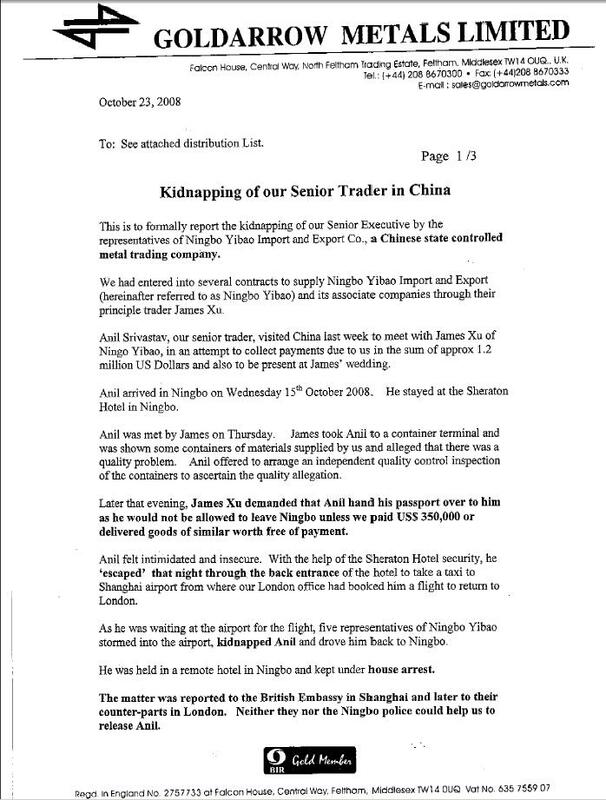 This sort of kidnapping is happening much more often that people think because it is rarely covered in the media (never in Chinese media) and most foreign companies are unwilling to publicize it out of fear of retribution by China. When I have talked about this in my blog (unclechina.org) I get many disbelieving emails. Your story follows the same MO I keep hearing about – kidnappings under the noses of authorities at Pudong Airport. Adam, Can you find out if there were any claims between the two companies before the new shipments. Kidnapping someone who you owe money to didn’t make sense, and very bad for business. There is got to be more here. Sean – I’ve spoken to several people familiar with the situation, and nobody has suggested any prior claims. In fact, the fact that Gold Arrow was willing to extend more than US$1 million in credit suggests that the relationship was very good, indeed. According to one of my sources, Ningbo Yibao claims that Gold Arrow mis-loaded container(s?) with aluminum instead of copper, though I find that very, very hard to believe. Regardless, kidnapping IS very bad for business and unjustifiable no matter the nature or value of the commercial disagreement. The damage to Ningbo Yibao’s reputation is likely to be permanent. Adam, interesting point about inspections. I was recently involved with a project importing raw commodities from Southeast Asia, the transaction was L/C FOB therefore the inspection at loading was extremely important. I have no scrap experience, interesting that payment terms are so informal, and that the scrap market is so ambiguous. sorry if this is considered libel, but living in Ningbo, it’s quite well-known that the Sheraton has heavy mob influences and shady connections. I know personally of friends who have been told as much by management there when they went to file complaints about their hotel service. Great piece of reporting. I can easily imagine that this sort of thing will spread to other ‘markets’ as the global financial situation continues to worsen. Regional interest groups and local power bases will continue to act as they always have: with a total disregard of any pretense of unifying national interest or the illusion of “the common good.” In the land of historical and state-sanctioned inequalities the only common good is to do whatever needs to be done in order to keep the lid on. I’m afraid that this sort of thing is only the beginning. And the lid, unfortunately, is juddering more vigorously than it has in the past several decades. This is just another example of why those who in the recent past have ceded the 21st C. to the “wakening dragon” have been so totally off the mark. Law is still nothing but a word. Hang on. The ride’s going to get a lot bumpier. Thanks for this.